NBC Chicago will offer a live stream with complete coverage beginning right here. NOTE: Not all witness testimony will be available for streaming will not appear on camera. You may notice intermittent bars and pauses. Chicago police officer Jason Van Dyke took the stand in his own murder trial Tuesday, detailing his version of what happened the night he fatally shot Laquan McDonald. Van Dyke remained on the stand for 90 minutes as he defended himself against first-degree murder charges for fatally shooting 17-year-old Laquan McDonald 16 times. Jason Van Dyke takes the stand in his murder trial to testify on what he saw in the moments before and during the shooting of Laquan McDonald. "I could see his face. He had no expression, eyes bugging out of his head, huge white eyes staring through me," he testified. Van Dyke grew emotional as he recounted the moments before, during and after the shooting. "Once I realized he was on the ground, I stopped shooting," he said. Van Dyke testified he stopped shooting because his gun was empty. Then, he said in the time it took him to reload his gun things "drastically changed." After a brief recess Monday morning, a judge unexpectedly canceled court for the day in the trial for Jason Van Dyke, the officer charged with murder in the fatal shooting of Laquan McDonald. "In those seconds, [McDonald] had stopped moving," he said. At times, cross examination became confrontational. When prosecutor Jody Gleason remarked, “You didn’t have to get out of the car that night," Van Dyke responded by saying, "I didn’t have to go to work that night." Tuesday marked the fifth day of the defense phase in the trial. Court was canceled Monday due to a sick juror. The day began with testimony from a psychologist, who testified about the human body's reaction during stressful situations. In an unexpected turn, testimony was briefly halted after a journalist was caught recording part of the trial, a violation of the judge's orders. The reporter was taken into custody and held in contempt of court. In the nearly three weeks of trial so far, the defense has called more than 17 witnesses as they argue McDonald, a black teenager armed with a knife, posed a threat when Van Dyke, a white officer, opened fire on him. Attorneys have said that Van Dyke never should have been charged with murder because of an Illinois law that protects peace officers trying to arrest fleeing felons. Van Dyke was charged with six counts of first-degree murder more than a year after he shot McDonald on the city's Southwest Side. He entered a plea of not guilty. The shooting prompted massive protests across the city and catapulted Chicago into the national spotlight. The defense is expected to rest its case Wednesday. Special prosecutors rested their case against Van Dyke Thursday after calling 24 witnesses over three and a half days. So far in the trial, the jury has seen dashcam video of the shooting, graphic autopsy images of the more than a dozen gunshot wounds on the body of McDonald, recreated video of the shooting showing what experts say was Van Dyke's perspective and video showing 16 gunshots fired in under 14 seconds. 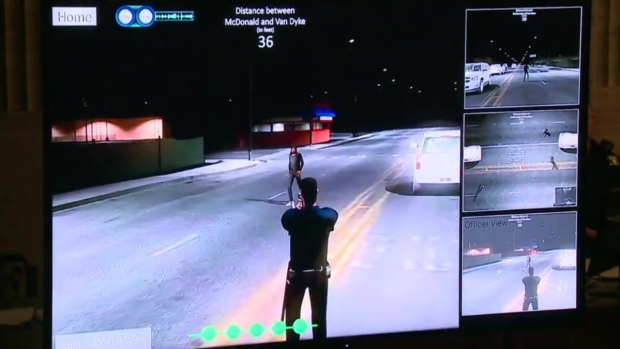 They have also heard testimony from several Chicago police officers and witnesses at the scene, seen the weapon Van Dyke used, heard from experts on how McDonald died and watched as FBI specialists demonstrated the shooting. Follow along live from court as the defense enters day five of its case. 3:12 p.m.: After calling four witnesses today, including the defendant himself, Jason Van Dyke, testimony has concluded for the day. Defense will rest its case tomorrow morning. 2:57 p.m.: Barry Brodd, also a use of force expert, says he feels Jason Van Dyke’s use of deadly force was justified. Then in a dramatic reenactment in the courtroom, showed how easily someone within 12-14 feet could attack you in just seconds. Brodd says he feels Jason Van Dyke’s use of deadly force was justified. Then in a dramatic reenactment in the courtroom, the 64-year-old man, showed how easily someone within 12-14 feet could attack you in just seconds. 2:45 p.m.: Defense testimony continues in Jason Van Dyke trial with an expert witness in self defense. 2:37 p.m.: At times, cross examination became confrontational. When prosecutor Jody Gleason remarked “You didn’t have to get out of the car that night," Van Dyke responded "I didn’t have to go to work that night." He often cut her off, saying, "Miss, I’m trying to answer the question." 2:27 p.m.: Jason Van Dyke completes his testimony, defending himself against first-degree murder charges in less than 90 minutes. 2:26 p.m.: Van Dyke says he stopped shooting because the gun was empty. Then says in the time between when he stopped shooting and reloaded, things "drastically changed." "In those seconds, [McDonald] had stopped moving," he said. 2:17 p.m.: While watching the dashcam video Van Dyke testifies "He wasn’t going towards the fence... It looks to me like he’s going from one side of the dotted line to the other side of the dotted line." 2:07 p.m.: When asked why he told his partner, Officer Walsh, "Oh my God, we’re going to have to shoot the guy" while still on their way to the scene, Van Dyke responded: "I thought the officers were under attack. The whole thing was shocking to me." 2:04 p.m.: Van Dyke: "I shot at the knife. I wanted to get rid of the knife." 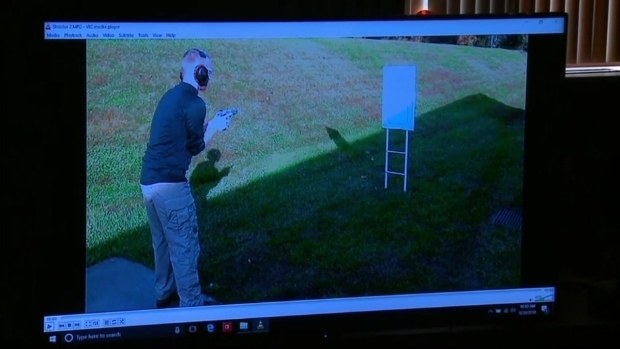 But prosecutors point out that officers are trained to shoot at the center of mass, not knives. "My focus was on the knife, all I could think." 1:57 p.m.: Under cross examination, Jason Van Dyke says he doesn’t remember what he told investigators immediately after the shooting. "I was still in shock." 1:50 p.m.: Van Dyke concludes his (at times) emotional defense testimony by saying he thought during [the second time], he only fired 2-3 shots. Prosecution will begin cross examination now. 1:46 p.m.: Van Dyke: "I wanted him to stay on the ground because easier position for us to take him into custody." 1:42 p.m.: Van Dyke: "Once I realized he was on the ground, I stopped shooting." 1:41 p.m.: Van Dyke says Laquan McDonald was advancing towards him. "I could see his face. He had no expression, eyes bugging out of his head, huge white eyes staring through me." 1:28 p.m.: Van Dyke testifies that that he’s had to draw his weapon more than 20 times in his 13-year career. When asked if he ever fired his weapon, he answered. "No, and I’m very proud of it." 1:15 p.m.: Judge orders Zachary Siegal held on a $1,000 D-bond after finding him in direct contempt of extended media coverage order and judge’s decorum order. Sun Times Reporter and others helped post the $100 he needs to bond out. 1:12 p.m.: Jason Van Dyke’s testimony is quickly stopped as the court deals with "technical difficulties." Should resume shortly. 1:12 p.m.: Interest is high in Van Dyke’s testimony. The courtroom on the 5th floor is packed to capacity with spectators and journalists. The overflow room, which up to now, has only been occupied by a handful of media, is now almost full. 1:00 p.m.: Jason Van Dyke will testify in his defense. 12:16 p.m.: Next witness, a CPD detective, is testifying how they recovered the CTA transit card of a disabled veteran in Laquan McDonald’s pockets. During opening statements, defense attorneys told jurors that Laquan was on a “wild rampage” in the hours before he was shot. 12:12 p.m.: Dr. Miller says Jason Van Dyke was consistent with his story and if he felt he was lying to him, he would not stick his neck out to testify today. 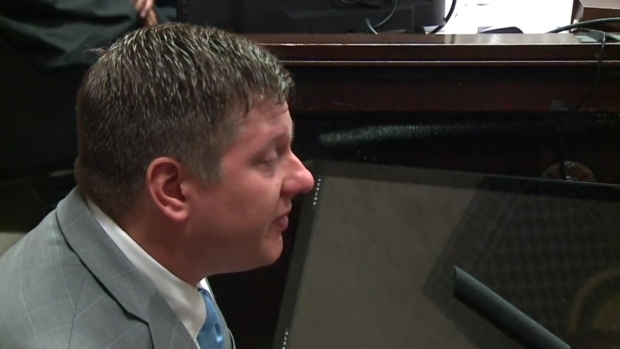 12:04 p.m.: Jason Van Dyke told Dr. Miller that Laquan McDonald looked at him with a dead stare. In return, Van Dyke "looked into his dead soul." Prosecutors ask if that stare occurred in the six seconds between when Van Dyke pulled up and opened fire or during the 33 second encounter. "He didn’t specify." 11:48 a.m.: Dr. Miller testifies about his conversation with Jason Van Dyke about the shooting. Jason told him that as he and CPD partner Joe Walsh, were responding to the scene, Van Dyke turned to Walsh and said, "Oh my god, we’re going to have to shoot the guy." 11:39 a.m.: Judge Gaughan abruptly sends out jury during cross examination of Dr Miller, because a member of the press was recording testimony in the courtroom. That journalist was taken into custody and in being held in contempt of court. 11:22 a.m.: Under cross examination by prosecutor Joseph Cullen, Dr. Miller says he’s being paid $10,000 a day for his testimony. And he only spoke to Jason Van Dyke via Skype. 11:06 a.m.: Dr Miller: "In my opinion, Jason Van Dyke was responding to what he perceived was a deadly threat and he responded according to training to neutralize the threat." 11:03 a.m.: Officers who fire their weapons can go through a critical incident follow-up to determine if they are ready to go back to work. Dr. Miller says it’s not like what you see on TV. “Firing a weapon - especially if it ends in death- is a profound event." 10:56 a.m.: The psychologist is talking about a 'deadly force mindset' and how in a life and death circumstance, humans encounter event compression- when an event was over in seconds, but they feel like it lasted several minutes. He speaks on how we experience tunnel vision and muffled sounds. 10:30 a.m.: Dr. Miller begins his testimony by describing the anatomy of the brain. Using diagrams of the brain, he’s explaining how and why we react to situations when we do. 10:10 a.m.: Week 3 in trial of Jason Van Dyke begins with the defense calling their 17th witness, Dr. Lawrence Miller- a psychologist.